The Collected Interior: Frugalicious Friday Recap...and a Winner! Frugalicious Friday Recap...and a Winner! Wow...can you believe we've had 14 editions of Frugalicious Friday already? I gotta tell ya, I am having a blast seeing all the Fabulous Finds, Crafts and Diy projects linked up every week. And this week we had a fabulous giveaway too...I love givin' stuff away! More on that in a moment, but first here are my favorite's from this fun day all about $aving! Amy from Design-Aholic linked up her inspirational plaque she made after buying this piece (with a different design) for just a couple bucks. Then she transformed it with paint and stencils into a super cute & thrifty home accessory...love this! Barbara from Hodge Podge shared her fabulous memory board and hand sewn pillow covers! She actually bought the fabric for the pillow project, then used the leftover fabric for the memory board. Isn't this black waverly fabric devine? 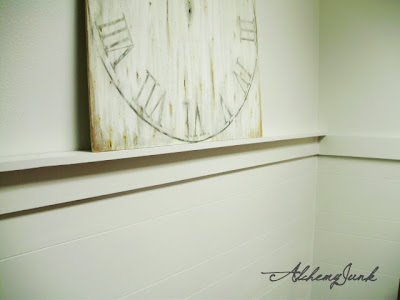 Stephanie from AlchemyJunk linked up her fabulous Shipboard Planking. This is so creative because it's really just 70's panelng turned sideways! Doesn't it look fabulous? And check out that Pottery Barn inspired clock! Yup, Stephanie made that too...I just love how she thinks outside the box! And finally Trixie from Flea Market Trixie shared with us her positively bee-autiful shabby chic hutch! Isn't this stunning? This hutch in it's past life was black, but she went light with the design and created a truly one of a kind piece. Great job Trixie, this is Fabulous! Congratulations Amanda! Send me your contact information girl, so Megan can ship these adorable hair accessories out! Thanks again to Megan and Heather from Fresh Poppy Designs for the fabulous giveaway...you crafty gals are Fabulous! 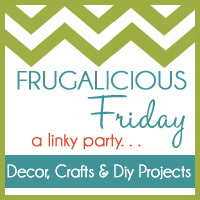 Okay, Frugalicious Friday is ON again this week, so have you got your thrifty projects ready? Yeah, me neither. That's okay, let's wing it together! See you Friday, if not before then! 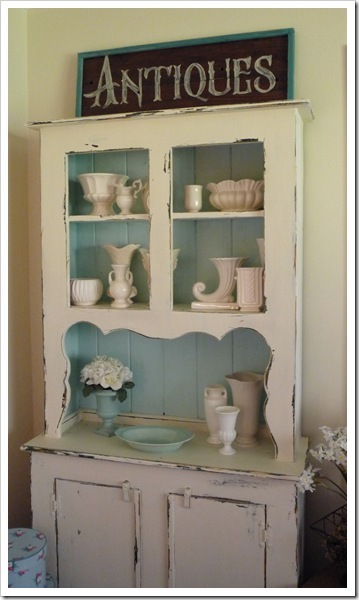 Amanda...I am in love with this hutch! and I love how she accessorized it too! Barbara, as always I can't wait to see what you've come up with! I know it'll be frugal and fabulous! That hutch is going to be in my dreams tonight, I am sure. How gorgeous!! Thanks for sharing.